I have been struggling to figure out what is going on with my BTA lately. 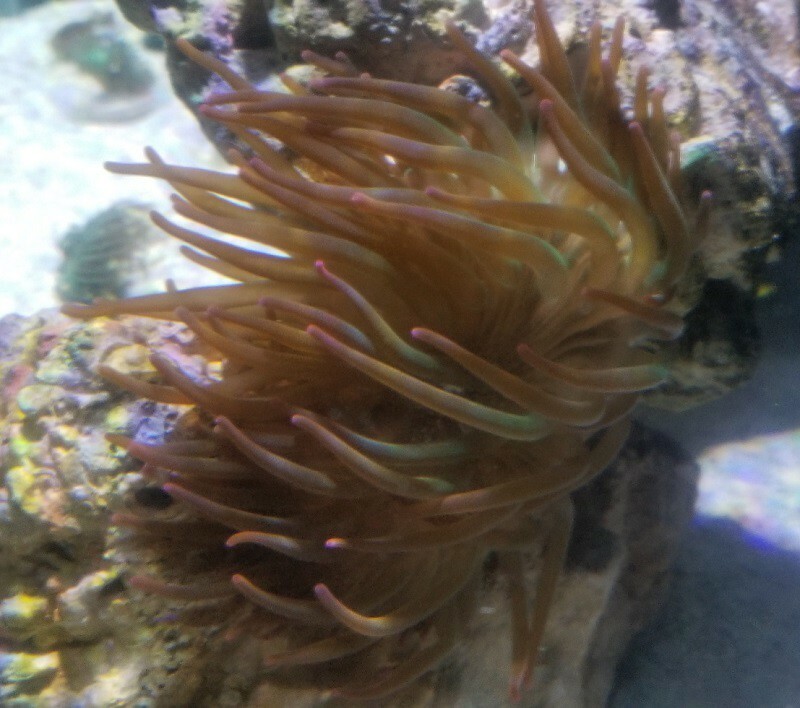 In my experience, BTA's are nearly bullet proof once settled in the tank, so I am a bit stumped. It just does not inflate or extend like it used to. It seems like it looks great for a couple of hours in the morning, but then deflates and looks "sad". It is not the only thing that seems to be struggling, my torch also does not extend it's tentacles anymore and my elegance seems to on it;s way out. I am not too concerned about either of these because they tend to be difficult long term. I sort of expected the elegance probably would not do well long term anyway. Everything else, including my Haddoni, is doing very well. The tank has been setup for 7 months. 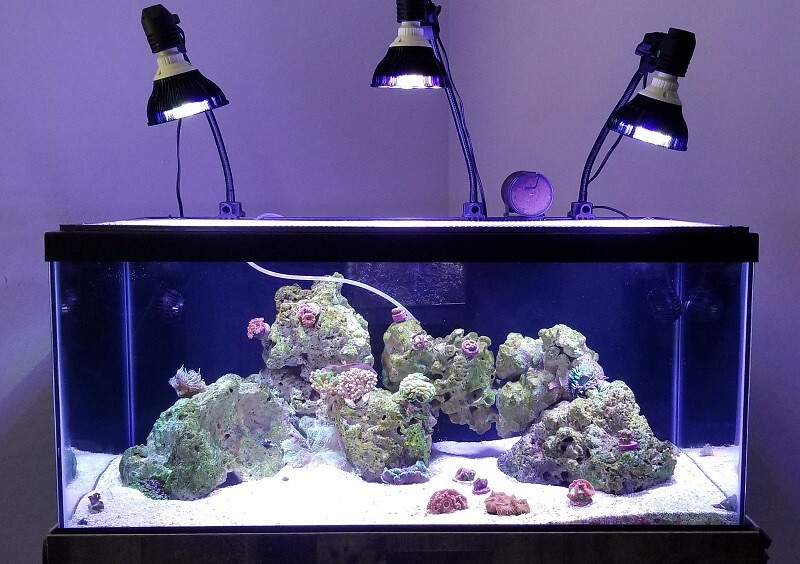 I use 0 TDS RO/DI water for ALL water changes (using IO Reef Crystals) and top-off. I do 10% weekly water changes. Only filtration is live rock, sand, and skimmer. I just put a filter sock in yesterday to catch all of the detritus the Jebao's stirred up when I pointed them behind the rock. I also added the GAC a couple days ago. Hopefully I covered all of the needed info. Please let me know your thoughts and recommendations. I have attached a few pics of the nem and tank. The first is what the nem looked like before, then this morning about an hour after lights on, and finally one of it this afternoon. I'm no expert by any stretch of the imagination but I do have a lot of bubble tips. TBO I don't think yours looks bad. Many of mine look like your first pic also in the morning. Some bubble some don't and some go back and forth. Sometimes they completely close up.The color on yours looks go too I think. Thanks for the reply. It is hard to tell from the pics, but in the first pic the BTA is about 7". In the second it is about 4-5". In the last one it is only about 2" and rather deflated. I am fine with it looking like the first 2, it is last pic, and most common form, that concerns me. I agree you BTAs look fine. Your nitrates are high but that will not bother BTAs in.my experience. It will likly lead to algae problems and may be you your tourch and elegance are not happy. Torches are not hard to keep at all. Also your calcium is pretty high. I would aim for 420-450. I would get a phosphate test kit as that could be an issue. I question if the par38 lights are enough light for your tank. But I don't know much about them. You need to know your phosphate level. Seachem kit is cheap and can easily tell you if your under 0.1. As for nitrate, 40 ppm is high, should be reduced to between 3-10ppm for corals. You need to come down on these anyways, may help your torch/elegance, may have some effect on your nem. If my water gets "dirty" say 20-30ppm nitrate and 0.25 phosphate, my nem will split. I guess I won't worry too much about the BTA at this point. Hopefully it will improve as the nitrates come down. laverda, I used my Seneye to test the PAR from these bulbs and got better results than I expected. I am getting ~200 at the surface and 75-100 at the sand. 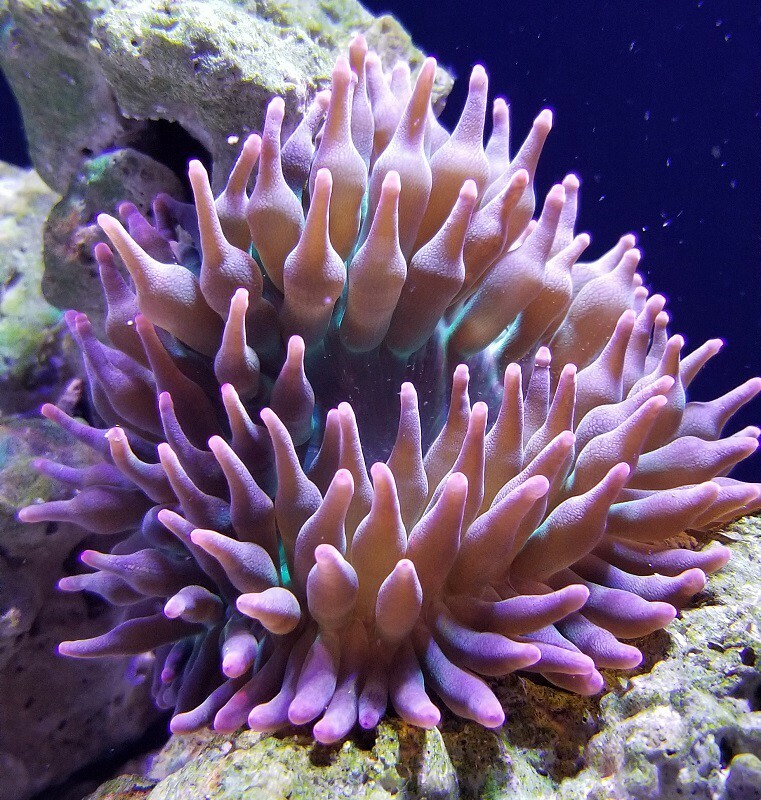 All of the corals, including Acans, mushrooms, favia, hammer, frogspawn, etc..., seem very happy with it. I also have a pair of Hydra 26HD that I can add if needed. I am holding them for a future tank build, hopefully in the next couple of months. I am working on getting the Nitrates down. Water changes do very little to help, I only have 1 fish in the tank and feed fairly light. I did have a couple fish "disappear" a few weeks ago due to a velvet outbreak. I can only assume they died and the snails and crabs got to them before I could get them. I am pretty sure this has helped add to the nitrate issue. This is also why no new fish have been added (or will be anytime soon). I am keeping up with the 10% weekly water changes and have started vinegar dosing. Today is day 4, so still have a ways to go. I have also added flow during the day to keep detritus suspended, and change the filter sock every other day to remove everything. As for P04, I'm really not concerned too much about it. I still plan on getting a test kit, but it is not a top priority. I do not have, or plan to have, any SPS, and there are no algae issues in the tank. I ordered a Salifert PO4 test kit this morning and will have it in a couple days, so I will be able to test for PO4. Everything else seems to be good. I will test Nitrate again tonight and see if there has been any change, then it will be time to increase the vinegar dose a bit. Iam not sure about those lights, are you sure about the colour spectrum? It's a reef spectrum right? The wattage works out at 18x3, not enough IMO for a BTA, I would be looking at 165W, LED, mine bubble only in the areas which get strong light....mine easily push 500 par max, 300 average. @500 PAR, I would COOK all of my corals. The nems have been under these lights for a couple months now, but the BTA only started having trouble recently. As I said, I have a pair of AI Hydra26 HD's I can set up if the PAR 38's really are not adequate. I feel like the nems should be fine under these. We used to keep them successfully under CFL and NO flourescents. I would think that those had far worse PAR and penetration than these. Do you think I would be ok giving it a week or two for the Vinegar dosing, to start doing it's thing and see if things improve and then, if no improvement, put the Hydra's over the tank? Honestly I don't see anything wrong with that anemone. Environment can make them change their appearance. I'll have to find pics of my old gbta, when first added it had thick tentacles, hints of purple with white stripes and pink tips. Over time it changed to something similar to your first picture. I'll search my photos for it. The top is how the clones were in the tank it originally came from, in about 6 months in mine it changed to the bottom pic. Also remember that the color can change in your tank. I got this one (trade for cheato), GBTA with purple column. and it ended up like this withing 6 months, I was running Radiums at the time. 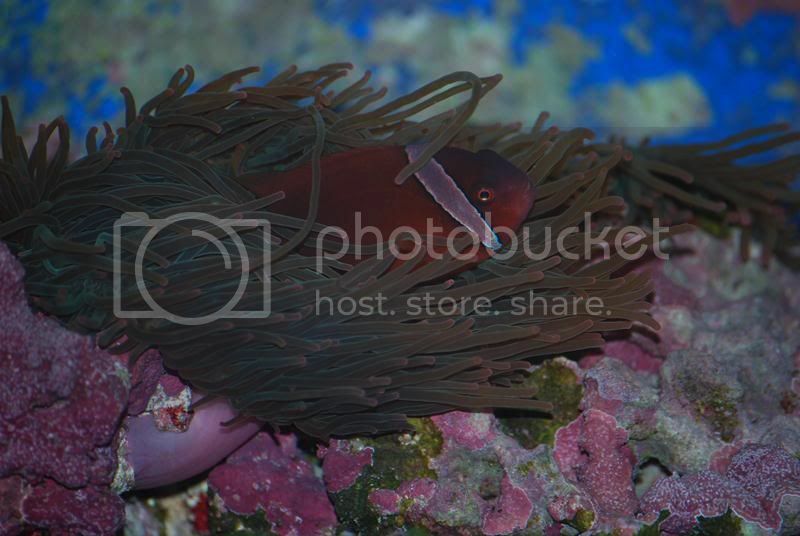 I would think the anemones want at least twice as much par. 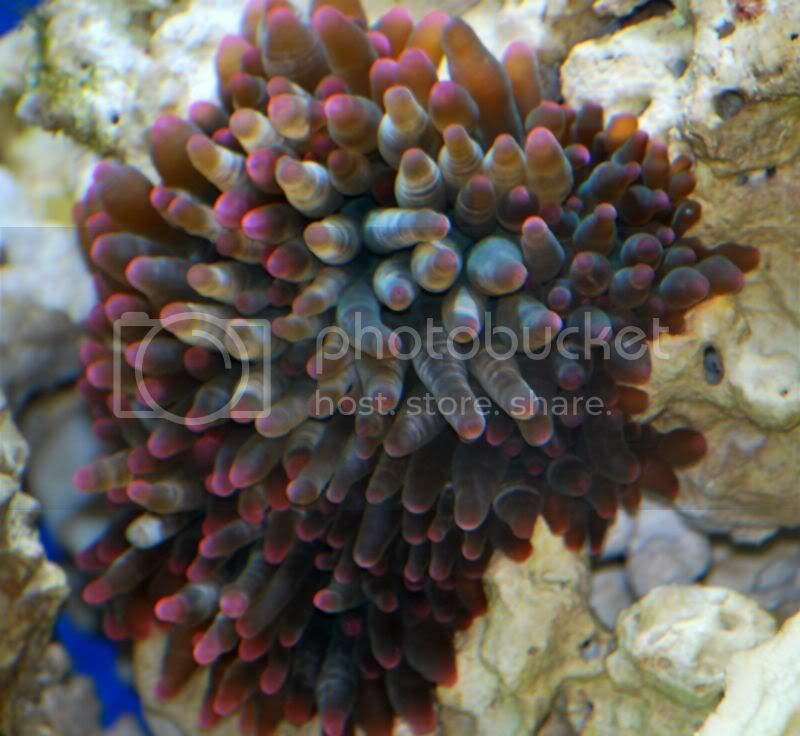 All your corals are lower light corals, where as the anemones require medium to high light. Give the viniger time. Do you have a good skimmer? I’ve kept many BTA’s over the past 2 years. Here’s what baffles me still. All the LFS in the area keep them in very low light and low flow.Colors are great . They’ve always been in high flow and high light in my tank and did well. Do they color better under lower intensities? Mine never lost much color except when parameters were out of wack for a while due to negligence but always always kept or developed bubble tips even though I was buying them with long stringy tentacles. Didn’t mean to hijack the thread , but rather bring up some observations for more experienced reefers to hopefully respond if at all possible. LFS only get away with it as the only have them a short time. If they don’t sell then you get bleached out ones that some stores will sell as rare color morphs at a premium. The nems seem to be doing VERY well under these lights. They have been under them for about 2 months now and the color is still great on both (I also have a carpet nem). 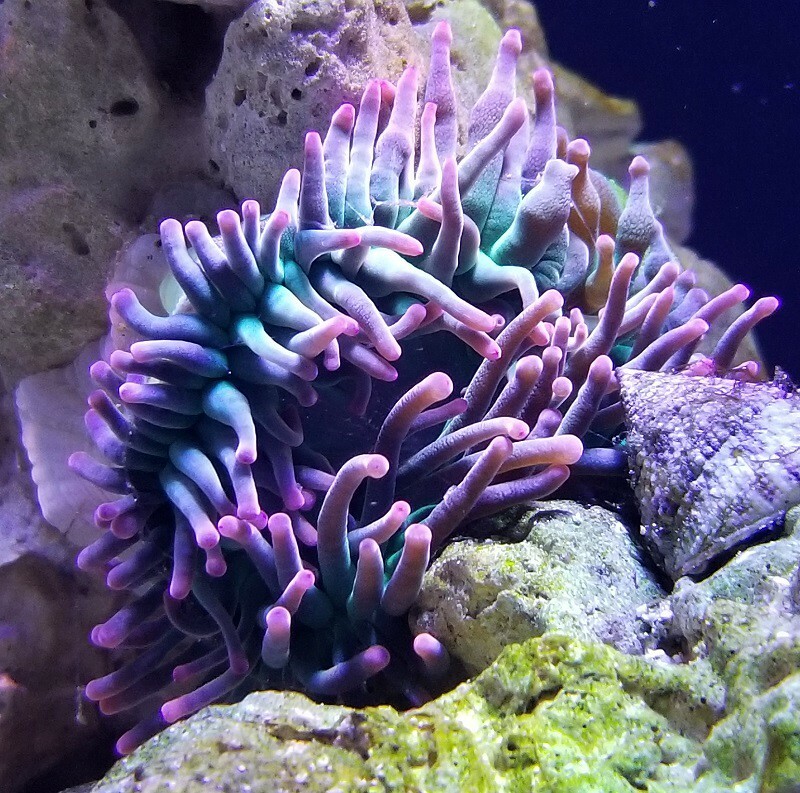 The BTA is doing quite well now. I have the NO3 down to 4 and finally tested PO4 last night, which is somewhere between .03 and 0.1. Unfortunately the Salifert kit I got doesn't show between those, though it looks closer to the .03. As for the skimmer, I don't know if I would necessarily call it a "good" skimmer. It is ok and I have it dialed in and pulling some consistent skimmate. It is a Bubble Magus NAC 3.5 and seems to be sufficient, just difficult to dial in.